(White Wave, August 2012, 272 pgs.) 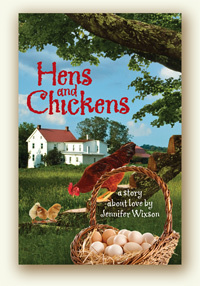 – Two women downsized by corporate America (Lila Woodsum, 27, and Rebecca Johnson, 48) move to Maine to raise chickens and sell organic eggs—and discover more than they bargained for, including love! Hens & Chickens opens the book on Sovereign and introduces us to the local characters, including the old chicken farmer Wendell Russell, the beloved retired music teacher Miss Hastings, the handsome carpenter Mike Hobart, and the Gilpin clan. 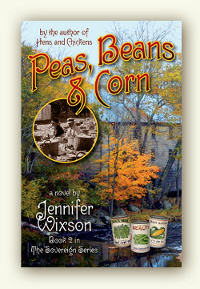 A little tale of hens and chickens, pips and peeper, love and friendship, Hens & Chickens lays the foundation for the next three titles in the series. Much like a fine tapestry the novel weaves from the 1940s to the present day revealing the story of Jana Hastings, a child musical prodigy who once graced the stages of New York. When an illness cuts short her career, Jana is sent to Windmere Sanatorium in central Maine for the treatment of TB. While at Windmere various events -- including first love, first loss, and the thundering approach of WWII -- catapult the self-centered teenager into mature womanhood. 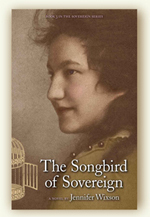 A poignant, stand-alone novel The Songbird of Sovereign is Jennifer's best effort yet. You won't want to miss a minute in this mythical Maine town.